Students, faculty, and staff who have provided their contact information in TuftsAlert will receive emergency alerts for their primary campus only; however, an increasing number of people spend time on more than one campus and may wish to subscribe to alerts from additional campuses. 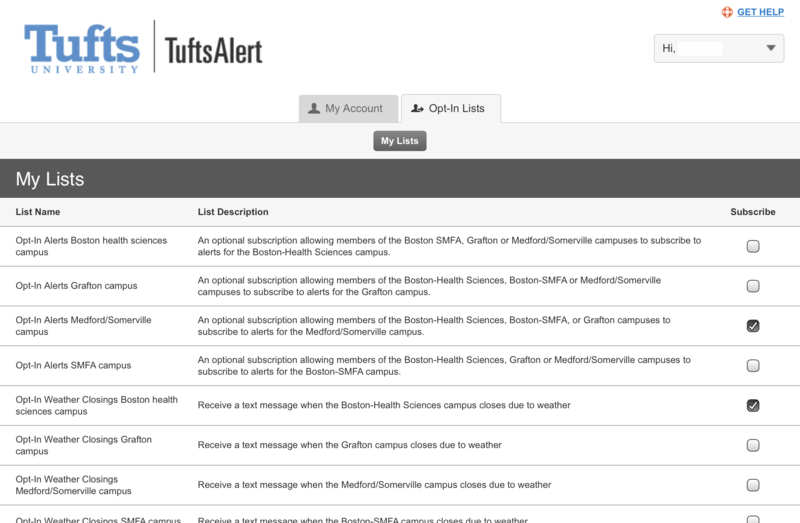 Additionally, TuftsAlert enrollees have the option to subscribe to notices for weather closings. Click the Opt-In Lists tab at the top of the page. Click the subscribe check box on the right to subscribe to opt-in lists. Your opt-in subscription is immediately active. You will automatically receive emergency alerts for your primary campus even if the subscription box is not checked. Students, faculty, and staff are automatically enrolled to receive alerts for their primary campus. This is based on school affiliation for students, campus designation in the Human Resources database for faculty and staff, and department/school affiliation for affiliates. You can check your campus/school affiliation on the Tufts University White Pages. You will automatically receive alerts for your primary campus even if the subscription box is not checked. To receive alerts for a campus or campuses other than your primary campus, you must opt-in to receive alerts. If you are in a dual degree program between schools on different campuses, it is recommended that you opt-in for alerts for both campuses. Your primary campus may change from semester to semester depending on school enrollment data, but the computer system is unaware of where you physically spend your time, which isn’t always the same as the enrolled school. Weather closing notices are strictly opt-in and you will receive a text message only if you sign up. Weather closings are communicated via multiple channels. Weather closing notices may be sent very early in the morning.